این مقاله ضرورت آموزش اصول مدل‌سازی سه‌بعدی کامپیوتری به دانشجویان مهندسی را بررسی می‌نماید. به این منظور ابتدا کاربردهای مدل‌سازی سه‌بعدی کامپیوتری در فرایند طراحی مهندسی و تأثیر استفاده از آن در سرعت و سهولت کار طراحی بررسی شده است. به این منظور سه مرحلة اصلی فرایند طراحی مهندسی یعنی "ایده‌پردازی"، "اصلاح" و "اجرا" به تفکیک بررسی شده، نتایج حاصله در قالب شش گزاره ارائه شده است. این گزاره‌ها حاکی از نقش محوری مدل‌سازی سه‌بعدی کامپیوتری در فرایند طراحی مهندسی است که بهره‌گیری از آن مستلزم فراگیری اصول علمی و کسب مهارت در زمینة کار با ابزارهای آن است. 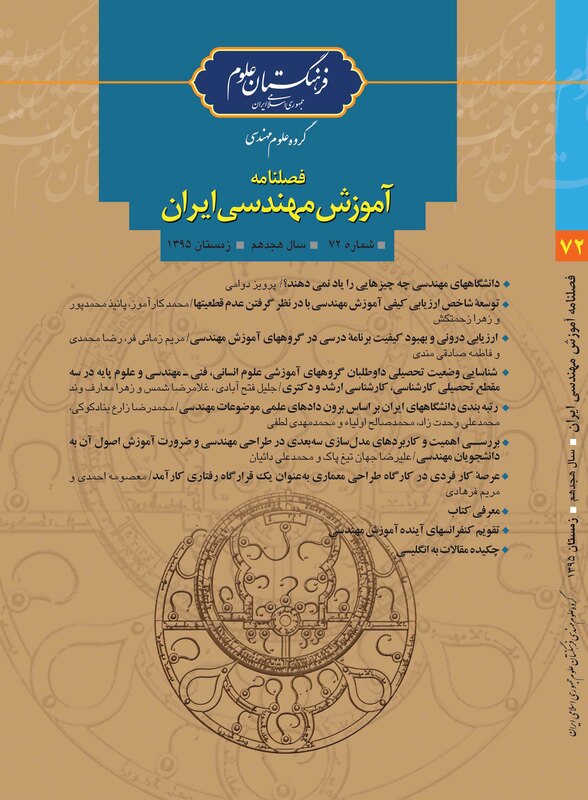 در بخش بعدی مقاله، 25 مورد از دروس مرتبط با مدل‌سازی سه‌بعدی در دانشگاه‌های برتر مهندسی دنیا ارائه شده است. نویسندگان در انتها با استناد به نتایج پژوهش، بر ضرورت تدوین برنامه‌ای جهت آموزش اصول مدل‌سازی سه‌بعدی کامپیوتری و ابزارهای آن به دانشجویان رشته‌های مختلف مهندسی و تحقیقات بیشتر در این زمینه تاکید نموده‌اند. 1Head of Engineering Graphics Center, Sharif University of Technology, Tehran, Iran. 2Instructor at Engineering Graphics Center, Sharif University of Technology, Tehran, Iran. The necessity of teaching 3D computer modelling to engineering students is studied in this paper. Firstly, the applications of 3D computer modelling in engineering design are described and then an investigation is carried out to understand how it can speed up and ease the design process. Later, three main stages of the engineering design process, i.e. "Ideation", "Refinement" and "Implementation" are introduced, and consequently the results are presented in the form of 6 statements. These statements demonstrate the essential role of 3D computer modelling in the process of engineering design, and outline the importance of learning its scientific principles, and working with the relevant computer tools in this area. Twenty-five examples of relevant to 3D modelling courses at a number of top ranked universities worldwide are provided. Finally, according to the results of this study, the need to plan for and establish a program for teaching the principles of 3D modelling and relevant computer tools to engineering students is emphasized. Lastly, the authors provided recommendations and directions for future research in this field. Abdelhameed, W. A. (2013). Virtual reality use in architectural design studios: A case of studying structure and construction. Procedia Computer Science, 220-230. Açici, F. K. (2014). The Place of Hand Drawing and Computer Aided Design in Interior Design Education. Procedia-Social and Behavioral Sciences, 716-720. Bertoline, G. R. (2009). Technical Graphics communication. New York: McGraw-Hill. Bertoni, A. (2013). Analyzing product-service systems conceptual design: The effect of color-coded 3D representation. Design Studies, 763-793. Chang, K. H. (2013). Product Performance Evaluation using CAD/CAE: The Computer Aided Engineering Design Series. Academic press. Chang, K. H. (2013). Using CAD/CAE: The Computer Aided Engineering Design Series. Product Manufacturing and Cost Estimating . Academic Press. Chang, K. H. (2014 ). Product Design Modeling using CAD/CAE: The Computer Aided Engineering Design Series. Academic Press. Crawley, E. M. (2007). Rethinking engineering education. In The CDIO Approach. Springer Singapore. Dieter, G. E. (1991). Engineering design. McGraw-Hill. Fernández, R. P. (2015), Virtual reality in a shipbuilding environment. Advances in Engineering Software, 30-40. Fowell, C. E. (2015). Rapid prototyping and patient-specific pre-contoured reconstruction plate for comminuted fractures of the mandible. British Journal of Oral and Maxillofacial Surgery, 1035-1037. Gibson, I. R. (2010). Additive manufacturing technologies. New York: Springer. Grishchenko, D. J. (2015). The TALL-3D facility design and commissioning tests for validation of coupled STH and CFD codes. Nuclear Engineering and Design. HKUST UG Course Catalog-Mechanical Engineering, Retrieved from publish.ust.hk/prog_crs/ugcourse. Hua, S. H. (2015). Numerical investigation of two-phase flow characteristics of subcooled boiling in IC engine cooling passages using a new 3D two-fluid model. Applied Thermal Engineering, 648-663. Huang, B. X. (2015). An automatic 3D CAD model errors detection method of aircraft structural part for NC machining. Journal of Computational Design and Engineering, 253-260. Ibrahim, R. (2010). Comparison of CAD and manual sketching tools for teaching architectural design. Automation in Construction, 978-987. Keller, T. G. (2006). Information visualizations for knowledge acquisition: The impact of dimensionality and color coding. Computers in Human Behavior, 43-65. Lawson, G. S. (2016). Future directions for the development of virtual reality within an automotive manufacturer. Applied Ergonomics, 323-330. Leake, J. M. (2013). Engineering design graphics. J Wiley & Sons. Lieu, D. (2008). Visualization, modeling, and graphics for engineering design. Cengage Learning. Cengage Learning. López, A. N. (2015). CFD study of jet impingement test erosion using Ansys Fluent® and OpenFOAM®. Computer Physics Communications, 197, 88-95. Musta’amal, A. H. (2012). Does CAD really encourage creative behaviors among its users: A case study. Procedia-Social and Behavioral Sciences, 602-608. Portman, M. E.-G. (2015). To go where no man has gone before: Virtual reality in architecture, landscape architecture and environmental planning. Computers. Environment and Urban Systems, 376-384. Qi, R. N. (2010). Numerical simulations of LNG vapor dispersion in Brayton Fire Training Field tests with ANSYS CFX. Journal of Hazardous Materials, 51-61. Rahimian, F. P. (2011). Impacts of VR 3D sketching on novice designers’ spatial cognition in collaborative conceptual architectural design. Design Studies, 255-291. Robertson, B. F. and Radcliffe, D. F. (2009). Impact of CAD tools on creative problem solving in engineering design. Computer-Aided Design, 41(3), 136-146. Rupérez, M. J. (2010). Contact model, fit process and, foot animation for the virtual simulator of the footwear comfort. Computer-Aided Design, 425-431. Sampaio, A. Z. (2014). The application of virtual reality technology in the construction of bridge: The cantilever and incremental launching methods. Automation in Construction, 58-67. Serrat, J., Lumberas, F. and Lopez, A. M. (2013). Cost estimation of custom hoses from STL files and CAD drawing. Computers in Industry, 64(3) 299-309. Shen, Y. O. (2008). Product information visualization and augmentation in collaborative design. Computer-Aided Design, 963-974. Sönmez, M. (2013). Creativity and Solid Modeling. Procedia-Social and Behavioral Sciences, 169-173. Tarshizi, E. S. (2015). Simulation and animation model to boost mining efficiency and enviro-friendly in multi-pit operations. International Journal of Mining Science and Technology, 671-674. Toh, C. A. (2015). How engineering teams select design concepts: A view through the lens of creativity. Design Studies, 111-138. Tuchkevich, E. R. (2015). ADN and AP Programs for civil engineering students. Procedia Engineering, 1142-1147. Wang, X. (2016). 3D FEM analyses of the ultrasonic transducer for controlled nanowire rotary driving. Applied Acoustics, 157-162. Wen-ming, X. A.-m.-H.-f.-f. (2015). An integrated CAD/CAM/robotic milling method for custom cementless femoral prostheses. Medical engineering & physics, 911-915. Xiao, W. Z. (2015). A complete CAD/CAM/CNC solution for STEP-compliant manufacturing. Robotics and Computer-Integrated Manufacturing, 1-10. Ying, B. Y. (2015). Correction of facial asymmetry associated with vertical maxillary excess and mandibular prognathism by combined orthogenetic surgery and guiding templates and splints fabricated by rapid prototyping technique. International journal of oral and maxillofacial surgery, 1330-1336.